Pipedream iSex USB Bullet. Give "plug-n-play" a whole new meaning with this incredible collection of portable USB-powered pleasure devices. All iSex travel accessories are easy-to-use, perfect for beginners, TSA-approved, and eco-friendly. 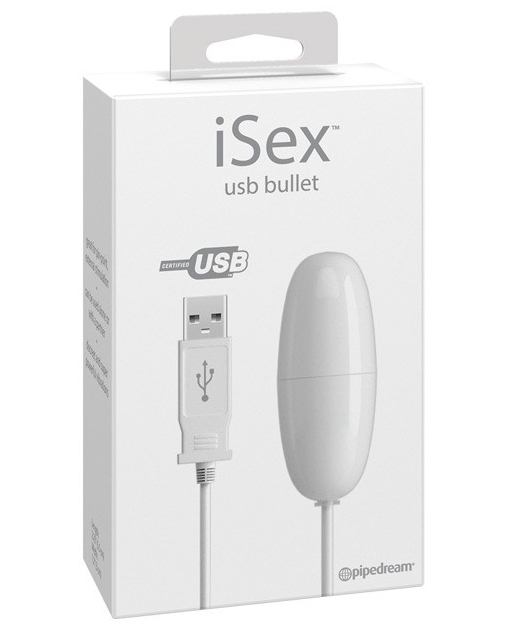 There's no need for batteries - just plug an iSex device into the USB port in your computer, car, or cell phone plug and you're ready for fun! The super strong vibrations will tease and please, and best of all, no one will know your little secret. They're great for college students, long distance video chats, solo stroking sessions, office rendezvous, road trips, and any other time you need plug-n-play satisfaction! Great for pinpoint external stimulation. Can be used alone or with a partner. Discreet and super powerful vibrations. No batteries required, just plug and play. Works in any USB port. The ultimate online accessory. Perfect for first-timers. Length: 2.25" (5.5 cm). Width: 1.2" (3 cm).